There are many great things about Paul Collins’ trilogy, The Maximus Black Files, but there is one certified characteristic of the trilogy – a characteristic that effortlessly binds all three books – and that is the thrilling and interminable action-packed disposition that keeps the reader hanging on the edge of their seats. The latest and last book in the trilogy, The Only Game in the Galaxy, wastes no time in hauling readers into the fast-paced story line. By the end of the first page, readers are back in the sci-fi galaxies that create the perfect scene for the trilogy, right by the sides of our protagonists – megalomaniac Maximus Black and the hard-edged saviour Anneke Longshadow. Anneke has thwarted another attempt on her life by Maximus but ends up with amnesia. When Maximus, in his renovated guise as Nathaniel Brown, sees Anneke return to RIM headquarters, unharmed but without memory, he uses this to his advantage, making Anneke an ally. But soon Anneke’s memory starts to come back to her and she takes her rightful place in a cast of intriguing characters that help her save the galaxy from the evil plans Maximus has to have his own dictatorial empire. An all out war ensues between Maximus’ army and Anneke’s forces; one filled with beastly Omegans, age-old dreadnought ships and a protected fortress. But what neither Anneke nor Maximus know, is that Maximus is not the anticipated chosen one of Kadros as the Envoy had led him to believe, marking a different fate for the galaxy, for Maximus, for Anneke and the actual chosen one. While this book is a thrill seeking sci-fi adventure – ripe with time travel, the significance of history and highly developed characters – it is also much, much more. 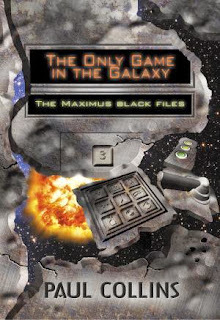 With many subplots woven meticulously together, The Only Game in the Galaxy is a cleverly written story with threaded themes of friendship, honour, love, identity and choices. As it brings this fantastic trilogy to a close, this book answers many questions readers may have been asking as they read to this point. We uncover more of Maximus’ and Anneke’s back stories, we find out the significance of Deema (Anneke’s foster child) and the history of the characters that make this book so rich. Paul Collins has created a trilogy that will no doubt live a deservingly long shelf life in the collection of many teens.